Every year, the city of Amsterdam organises the Amsterdam Light Festival. In 2018/2019, the Amsterdam Light Festival is from 29 November 2018 until 20 January 2019. International and national artists have created 30 spectacular light sculptures especially for the light exhibition in the canals of Amsterdam. This year’s theme is ‘The Medium is the Message’. The best way to see the Amsterdam Light Festival is by Canal Cruise. The light art installations are placed in and around the Amsterdam canals. From the end of November 2018 till the end of January 2019, the inner city of Amsterdam lights up with light sculptures, projections and art installations along the Keizersgracht canal. The light art installations of the Amsterdam Light Festival water exhibition illuminate every day from 5 pm until 11 pm. The Amsterdam Light Festival is in open air and so free for everyone. Great opportunity to take impressive photos! The best way to visit the water exhibition is by boat. Canal cruise companies offer special guided cruises along the artwork. The Amsterdam Light Festival Cruise takes 75 minutes. You can see the art works of light from the Festival of Light walking on the Keizersgracht. The route is 8,50 kilometer if you walk it by foot. The route of the Amsterdam Festival of Light. Below you will find an impression of the Amsterdam Light Festival of this year and earlier years. Amsterdam Light Festival 2018/2019: Light a Wish by OGE Group. Starry Night at the Light Festival in Amsterdam, by a Ivana Jelić and Pavl Petrović. Spider on the Bridge at the Festival of Light in Amsterdam 2018. 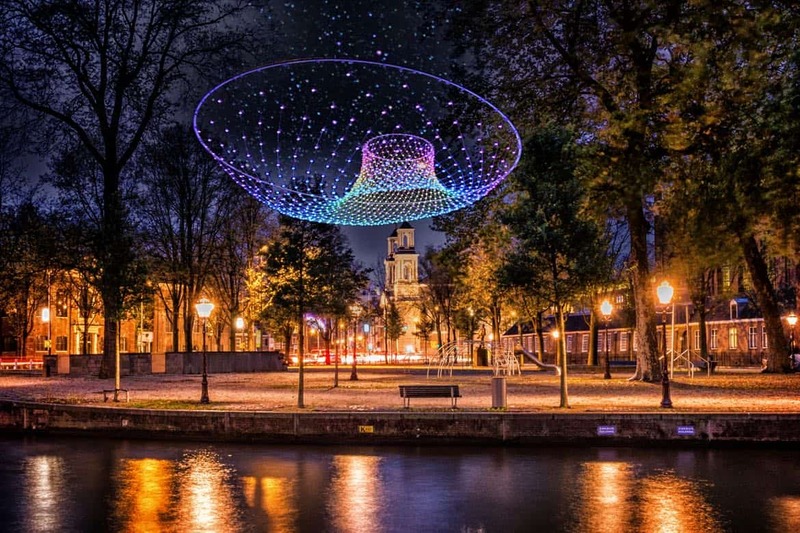 Amsterdam Light Festival 2018/2019: Parabolic Lightcloud by amigo amigo.